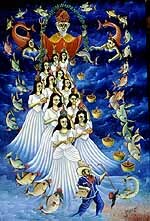 A gallery of Haitian art. Madsen Mompremier was born in Gonaives, Haiti on August 12, 1952. In 1973 he started to paint as a student of Gerard Valcin. Originally, Mompremier painted delightful scenes of everyday Haitian life, peasants in their villages and cane fields. Around 1975 he found a style which he has now been refining for more than twenty years; painting Voudou gods with great majesty and precision. 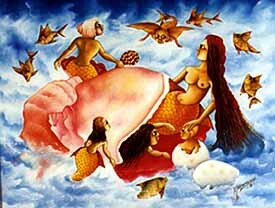 His favorite one is Erzulie, goddess of love in her incarnation as La Sirene. Coincidentally, he is married to a woman named Erzulie, who is also an artist. Cousin Zaka in the Court of Agoue"